The new DATA Step Debugger is a tool that enables you to find logic errors in a DATA step program. With the DATA Step Debugger, you can watch the variable values in a program change as the program runs. You can execute the program line by line, and you can also set specific breakpoints in the program. You can now transfer files from your local computer to a SAS server or from a SAS server to your local computer by using the Copy Files task. The Copy Files task works in a similar way to an FTP application. However, this task relies on the SAS protocols to complete the file transfers and does not require an FTP server. 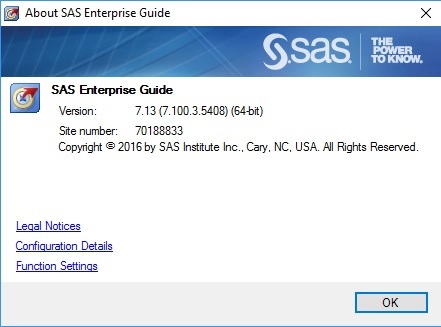 You can upload your existing SAS 9.4 data to SAS Cloud Analytic Services (CAS) by using the new Upload to CAS task. Starting with this release, the default graph format is PNG. Use the new Graph Format for Built-in Graph Tasks option to set the default format for the graph tasks, such as Bar Chart, Line Chart, and Pie Chart. You can specify whether to continue executing a process flow if an error is encountered. Server file navigation now defaults to your Documents folder on Windows servers. In addition, the file navigation now contains folder shortcuts. Назад Предыдущая запись: Что делать если нужно подключить несколько Active Directory серверов? Далее Следующая запись: Как выглядит отчет об аудите в SAS Visual Analytics?